Naval Air Facility Atsugi, located in Kanagawa Prefecture on mainland Japan, is the Navy's largest air base in the Pacific and home to the Carrier Air Wing Five. CVW-5 consists of eight squadrons that deploy with the aircraft carrier USS George Washington. The mission on base is to support the combat readiness of Carrier Air Wing 5, the Helicopter Maritime Strike Squadron 51 and the tenant commands assigned to the base. Aircraft flown at NAF Atsugi include the F-18 Super Hornet, the EA-18G Growler, the Hawkeye 2000, the C-2 Greyhound, the MH-60S Seahawk and the Sikorsky SH-60B helicopter. NAF Atsugi is 22 miles southwest of Tokyo. There are many exciting opportunities near base for personnel and their families to experience the local culture. Attractions near base include Kamakura the Great Buddha, Tokyo Disneyland, large shopping districts and beautiful beaches. 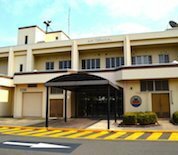 This NAF Atsugi directory features the critical info you’ll need to navigate through the many facilities and recreational opportunities available on base.